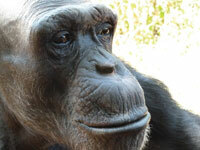 Toto the chimpanzee, was reunited with his own kind at the Chimfunshi sanctuary in Zambia, being a protective uncle to a family of young rescued chimps until he died peacefully in his sleep in July 2014. Toto was snatched from his wild family as a baby, imported to the USA, then sold with four chimps to a circus in South America. The other chimps died leaving Toto alone, living in a packing crate, forced to drink coffee and smoke cigarettes for over 20 years - that’s how ADI found him in Chile. We rescued him and took him to Zambia. Check out the gallery showing Toto’s Rescue. Check out the gallery showing Toto meeting another chimp for first time in 20 years. Check out the gallery showing Toto’s life at Chimfunshi.